Brother Inkjet Printers are renowned for having the problem of the black cartridge not printing. This has been a common issue with Brother Inkjet printers for as long as I can remember. No-one, (including Brother) seems to know exactly why this problem is so common and even why it has continued to plague Brother printers for so many years. In this article I want to first start with the main reasons that could cause this problem to occur followed by the solutions. Overall Brother inkjet printers are very reliable and if used regularly and correctly then very few issues will occur. Brother printers work perfectly well with generic ink cartridges, in fact there should be absolutely no difference whatsoever in both operation and print quality using non genuine cartridges as long as they are good quality generic Brother cartridges. What can cause a Brother printer to not print black? There are quite a few scenarios that can stop your Brother printer from printing in black. Here are some of the main reasons, including a few things to check before getting too carried away with the situation. Remeber that issues will almost always begin when a new cartridge is installed. DO NOT blame the cartridge as it is almost NEVER the cartridge which is at fault even though this is when the problem may have first appeared. 1. Check that the "Breather Tape" on the top of the cartridge is fully removed. The breather tape or sometimes reffered to as the shipping tape MUST be removed before installing the cartridge. If this is not removed then the ink remains vacuum sealed in the cartridge and it will not come out under any circumstances. When your printer starts warning you that the Black cartridge is getting Low and needs to be replaced it's OK to keep printing for a while but not for too long. I know that we all want the most from our cartridges but if you print too long and the ink runs very low then you will start introducing air into the print nozzle. When air starts to get into to the nozzle or the lines going to the nozzle then the printer will stop printing in black. It may not fully stop and you may simply get lines through the printing. This indicates that some of the nozzles are blocked but not all of them. Also when you print with a near empty black cartridge then the air going into the print nozzle will start to dry the ink that is already in the nozzle. If you continue to print like this for a long period of time then you may even permanently damage the printhead. It's kind of like running a car for too long without coolant in the radiator. There have been many articles written about sticking electrical tape over the small window at the front of your Brother cartridges so that you can keep printing and the printer then cant tell if the cartridge is run out of ink. Wev'e all dont this before but let me tell you it WILL eventually kill the printhead if you keep doing it long enough. Brother inkjet printers, like any other printer brand uses specific inks in their printers designed to perform correctly with their own machines. Due to the massive availability of generic cartridges there is a huge difference in quality between one generic ink and another. If the viscosity of the ink is not correct and similar to the Brother inks then various issues can occur. The ink needs to flow at the correct rate and also needs to be formulated to NOT CONGEAL or dry too fast. Printer inks actually contain various chemicals which prevent the ink from drying. This doesnt effect them drying on the actual paper but it does prevent it from drying out in the printer itself. At Ink Hub we have done stringent tests over the years to check the drying rates of various non genuine inks. This has enabled us to provide generic cartridges which we believe are the best on the market. Brother printers which have a CISS fitted are also at risk of printhead clogging. This is due to several factors such as poor quality ink being used, tanks not being mixed often enough causing sediment to gather at the bottom of the tanks or not being used often enough. All of these factors can cause the black ink or the colours not to print. We belive that prevention is better than cure so PLEASE try to abide by the following suggestions and avoid problems from occuring. By printing regularly there is ink constantly flowing through the printhead which in turn helps to prevent ink from sitting in the nozzle and eventually drying out and blocking the fine print nozzles. As discussed previously a high quality generic cartridge will utilise a quality ink which is formulated to both produce high quality printouts and a correct viscosity and chemical formula which will not clog the print nozzles. If your printer is situated near a window or any other warm place then it is far more likely that ink may congeal inside the printhead when not in use. By moving the printer to a cooler location it may prevent issues from occuring. 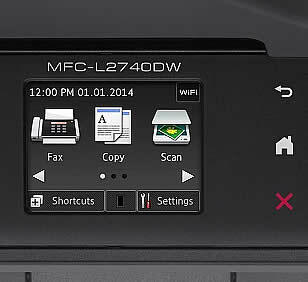 If your printer suddenly stops printing black then check the following in this order. 1. Is the breather tape at the top of the cartridge fully removed? 2. Has the new cartridge been recognized correctly by the printer? If not then follow this procedure. 3. Run a maximum of 2 nozzle cleans on the black print nozzle from the LCD menu on the actuall printer itself. Follow this procedure to clean the offending nozzles. Note: Only use the nozzle cleaning procedure a couple of times as too many times can actually make the problem worse. 4. Try printing a few solid black images with the printer set to the highest quality photo mode. This ensures that ALL nozzles are printing and may help to push the ink out of the nozzle. 5. If none of the steps above help then you may need to use a printhead cleaning kit to break down the dried ink that is inside of the printhead. Below is a great video which shows the procedure in great detail. Our printhead cleaning kits are available here. Checkout this great video on Cleaning a Brother printhead.